The esophagus is a muscular tube that allows food to pass from the mouth to the stomach. When you eat or drink, liquids and solids are pushed through the esophagus through a process called peristalsis until they reach the Lower Esophageal Sphincter (LES), which is located at the junction of the esophagus and the stomach. The lower esophageal sphincter (LES) normally relaxes when we swallow allowing foods/liquids into the stomach, when we burp in order to allow air to escape and when we vomit. A weak or loose LES allows abnormal reflux of stomach contents into the esophagus which can causes “burning” of the esophagus by stomach acid. This presents as discomfort in the esophagus called “heartburn”. In some patients, the reflux goes high into the esophagus and throat causing symptoms such as cough, hoarseness and clearing of the throat. Although occasional heartburn is common, especially after a heavy meal, more than 40 million Americans suffer daily from severe and persistent symptoms of gastroesophageal reflux disease despite medications. GERD is a painful and often serious disease. It has been linked to the steady rise of esophageal cancer. If gastroesophageal reflux is left untreated for a long period of time, the sensitive tissue in the esophagus will become inflamed (esophagitis) and can cause pain. Extended exposure can lead to sores or ulcers in the esophagus which may lead to bleeding. You may also develop scar tissue which may lead to a stricture which will narrow the esophagus and make it difficult to swallow. 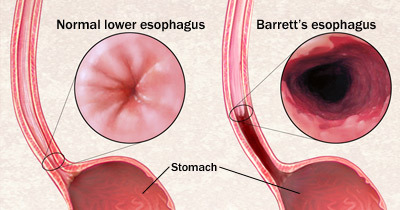 Chronic irritation due to reflux can also lead to the growth of abnormal cells in the esophagus, called Barrett’s esophagus. This has been linked to an increased risk of esophageal cancer and requires close surveillance, discussion with your gastroenterologist and is best treated by a combination of medical and surgical therapies. It is important to appropriately diagnose patients before committing them to lifelong therapies. Forty percent of patients on daily antacids do not have significant GERD and do not need their antacids. And a significant amount of patients with extraesophageal symptoms such as cough and hoarseness are undertreated for their GERD. This is why at the Tampa Bay Reflux Center we strive to help our patients first arrive at the correct diagnosis and then recommend appropriate therapies. In order to do this we use a combination of the below diagnostic tests. Lifestyle changes can significantly reduce the severity of GERD symptoms. Smoking, caffeine, alcohol, chocolate, citrus ad fatty foods can all trigger GERD. The first step is to avoid these agitators. Losing weight, eating smaller meals, eating more slowly and sleeping with the left side down all offer some relief. Over the counter medications include antacids, H2blockers and Proton Pump Inhibitors (PPI’s). Many patients have already tried medications before seeking medical advice. For occasional heartburn, the medications are the mainstay of treatment as they are very effective. Unfortunately for frequent symptoms, life-long therapy is prescribed. Patients often do well on medications for years but in time they often grow resistant to these powerful medications. With a growing body of literature suggesting that long term usage of antacids may cause vitamin deficiencies, osteoporosis, pneumonia and Clostridium Difficile colitis, many patients are looking for alternatives to their medications. Patients chose to have surgery for many reasons. Patients who have regurgitation of food, hoarseness, asthma or findings of esophagitis, esophageal stricture and Barrett’s esophagus should consider surgical repair of their lower esophageal sphincter (LES) as these conditions will not improve with medication alone. Some young patients choose to have surgery because they do not want to be on medications for the rest of their life. This is also an acceptable reason. 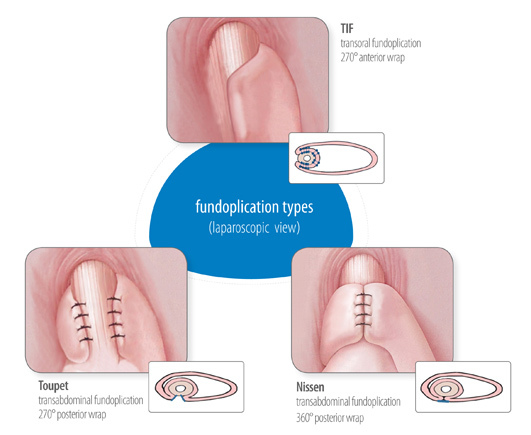 Nissen fundoplication is a surgical procedure designed to prevent acid reflux by reinforcing a weak lower esophageal sphincter with the patient’s own stomach tissue. During the procedure the upper portion of the stomach (funds) is completely wrapped (plicated) around the bottom of the lower esophagus and then stitched into place to create a strong barrier that prevents stomach acid from backing into the esophagus. This procedure has been around for decades and has great success and durability when used in the correct patient population. The Nissen fundoplication is performed laparoscopically, which requires 5 small incisions on the upper abdomen. Patients typically stay overnight in the hospital and can return to work within 2 weeks after surgery. Patients are maintained on a soft diet for a few weeks after surgery, but then can eat all foods without restrictions. Most patients leave the hospital the day after surgery. If their job does not require strenuous activity, they are usually able to return to work in one to two weeks. After surgery, you will be kept on a soft diet in order that food does not get stuck secondary to swelling immediately after surgery. Specific diet instructions are located here. You will want to chew slowly and thoroughly and avoid carbonated beverages. Fully cooked pasta and vegetables are a good choice while heavy meats and raw vegetables are likely to cause problems. Once the swelling has dissipated within four to six weeks, you will be able to resume eating all foods without restrictions including those that used to cause reflux symptoms! We follow all of our patients closely with appointments every 2-3 weeks after surgery. We usually see patients for 2 or 3 post-operative visits at which time they are usually eating all foods and off all their antacid medications. We call of our reflux patients yearly to ensure that they have continued resolution of their symptoms.